On the Sundays after Easter they said three Nocturns with nine lessons. They had a procession or station before the Crucifix on Saturday after Vespers and on Sunday after Lauds until Christmas. From Easter to Pentecost they sang of the Resurrection, and from Pentecost to Christmas a responsory about the Cross. During the Sundays between Easter until the Ascension the Morning Mass was of the Sunday, and the High Mass of the Resurrection, Resurrexi, as on Easter day. This is the case in many missals from the past century. Only a hundred years ago it was changed to follow the Roman Missal. If the Major Litany, that of the 25th of April, fell during the Octave of Easter or on one of the Sundays after Easter, they observed no fasting or abstinence, and held no commemoration except for a procession that was appropriately festal—nisi festiva tantum processio—, where they sung nothing sad or redolent of penance. This is still observed in Rouen, for in these cases they go to the nearest church singing the Responsory Christus resurgens. Inside the stational church they sing a responsory or antiphon of the holy patron, with a versicle and collect. Then they return to their own church singing the Litany of the Saints, and after they have entered the church they sing an antiphon, versicle, and collect of the patron saint, and that is all. This procession for the fruits of the earth is always held on the 25th of April. In former times, the pagans similarly prayed to their gods for their earthly goods. This discovery was made by M. Châtelain. But “if it should fall at any other time,” says the ancient Ordinal, “let all fast, except little children and the infirm.” In those days, all who had passed their seventh or eighth year were obliged to fast (less than a hundred years ago) in the Province of Normandy. I have learned this from two breviaries, one from Rouen in 1578, and the other from Avranche in 1592, at the beginning of which I find in the Kalendar the following instruction: Sacerdotes ecclesiarum praecipiant OMNIBUS AETATEM ADULTAM HABENTIBUS instituta jejunia observari, ut jejunium Quadragesimae &c. et omnia praedicta prohibeant expresse et sub poena peccati mortalis. This fast on St. Mark’s day was later changed to abstinence, in order to avoid fasting on Eastertide, following the spirit of the early Church. There are still families in Normandy that have done so from time immemorial and still today observe the great fast of Lent, that is, only one meal a day. In the diocese of Autun there are certain parishes where there are twelve, and even up to sixty plough-boys or thrashers who work from daybreak, and by 7 in the evening have still not taken any food, as one of their curés has assured me. God is pleased to preserve this spirit of fervor in certain families and persons in order to confound the laxity of the others. This makes one see that such a fast is not impossible. One should be persuaded thereof by everything that we have reported about different places in this entire account. One shall be fully persuaded when told that in Ireland they do not eat during Lent until the evening, and that in Rouen a certain major canon and a chaplain are still fasting at 4 or 5 in the evening of Ascension day, when the weather is much hotter than during Lent, and so such a long abstinence must be even harder to bear. Since on ordinary fasting days during the year they did not eat until after None, the ancient Ordinal states that on St. Mark’s day the procession from the Cathedral church to St. Ouen began after noon. The priest, deacon, and subdeacon wore albs, stoles, and maniples, which is still observed at present in the Cathedral and other well-run churches. Neither the ancient Ordinal nor the more recent one state that one should kneel during the prayers in the stational church; the more recent one says that the Mass Exaudivit should be said there. The two state that, after returning from the procession, they say None at 2 in the afternoon, and then go to their meal. The same thing is practiced on the three [minor] Rogation days. Ascension day was solemn like Easter. There were nine lessons on that day, like on Sundays of Eastertide. The Acts of the Apostles are read in the church of Rouen after Ascension until the first Sunday after Pentecost. That is truly the proper season, since this history begins at that point, and most of what it contains occurred during those days. On Pentecost day they sang hymns. At Terce they lit all the candles. The hymn was intoned by three canons in copes, who also incensed the altar. We shall see hereafter how this celebration became even more solemn. The last day of the Octave of Pentecost was solemn like the first, and like Easter. The Ordinal says, Dies octavus ut primus celeberrime agatur. The Ember Days were celebrated like the season of Lent, as in Orléans. On Ember Saturday, when holy orders were conferred, the Cantor led the choir of the Mass, which did not end until the night of the Sunday, for the Mass of the Ordination of Priests began in the evening at the hour for Vespers, which belongs to the Sunday, says the Ordinal of Rouen. (This is the reason why the Gospel of the Sunday is read at the Mass of Ember Saturday, a use that has remained unto the present day. In Missa vespertinali quidem hora, quae pars est Dominicae Resurrectionis, a B. Leone summo Pontifice caeterisque sanctis Patribus ordinum consecratio fieri consituitur, quae jejunis a jejunantibus conferatur. These last three words explain why the Mass has been anticipated so early. Nevertheless, the Ordinal continues, Ante Nonam fieri sacra auctoritate prohibetur. The Ordination or Consecration of bishops is always done on Sunday. We see in an ancient manuscript Pontifical of the Cathedral church of Rouen, about 700 years old, how a bishop was consecrated. It states that the dean, the major Archdeacon, the Cantor, and the Chancellor marked those that should serve as ministers for the bishop, just like they did on major feasts: sicut in majoribus mos est festivitatibus. There were two acolytes with two thuribles, seven acolytes who each carried a candlestick with a candle, seven subdeacons with the Gospel books, seven deacon who carried the relics of the saints, and twelve priests wearing chasubles. It cannot be doubted that this Pontifical is proper to the church of Rouen, for it contains these words: Interrogatio: Vis sancta Rotomagensi Ecclesiae mihique et successoribus meis obediens esse et subditus? ℟. Volo. Interrogatio. Vis mihi et ecclesiae meae professionem facere, sicut mos ANTIQUITUS constitutus obtinuit? ℟. Volo, et paratus sum in omnibus obedire. This ancient usage is still observed in the present day in the Cathedral church of Rouen, where they consider it as it were a right of this church to receive the obeisance of the suffragan bishops of the province, because it is the Metropolitan and Primatial Church of Normandy, confirmed as such by a most ancient right, and seen in the ancient Pontifical mentioned above, which even states that it is a “very ancient usage,” citing papal bulls and rulings of the court of Parliament. The suffragan bishops must present this obseissance in the hands of the Lord Archbishop, if he is present; if he is absent, in the hands of the celebrant at the moment when he has gone up to the altar before reading the Introit. Although the Mass is only of a feria, it is said as a double, with the Gloria in excelsis and the Credo, and the Cantor leading the choir, which only happens on doubles and triples. Ego N. Episcopus (Lexovinensis) Venerabili Ecclesiae Rotomagensi ac Reverendissimo Patri Domino N. Archiepiscopo et suis successoribus canonice intrantibus reverentiam et obedientiam me perpetuo exhibiturum promitto. And he signs his name in a manuscript covered with ivory which is kept in the sacristy of the Cathedral church. In it, there are a number of signatures of suffragan bishops and of abbots and abbesses of the diocese of Rouen. At the first Solemn Mass which M. Colbert, Archbishop of Rouen, sang in his Cathedral after receiving the pallium, there were two suffragan bishops who presented their oath of obedience before the reading of the Introit. Without presenting this oath the suffragan bishops are not recognized in the Metropolitan Church, are not admitted into the provincial assemblies, and are not allowed to be deputies of the province for the Assembly of the Clergy. Not only must they swear the oath of obedience, but also to dine with the Messieurs du Chapitre (Lords of the Chapter), in lieu of which they usually give 100 écus. This is apparently what is called the droit de past or right of repast, jus pastus in Latin. On Pentecost day 1694, the new Abbess of St. Amand in Rouen, of the Order of St. Benedict, gave the same oath of obedience during the High Mass of Pentecost, which was done with solemnity. This Abbess came accompanied by twelve of her nuns, who took their places in the second row of the stalls of the chaplains, and the abbess in the upper row, in the same place as a suffragan bishop when he is present in the Office or for a similar ceremony. At first she simply had a foot mat. During the Kyrie, the Lord Archbishop’s faldstool is placed at the bottom altar step. The Archbishop, with his back to the altar, received in his hand the oath of obedience of the abbess, who knelt before him. 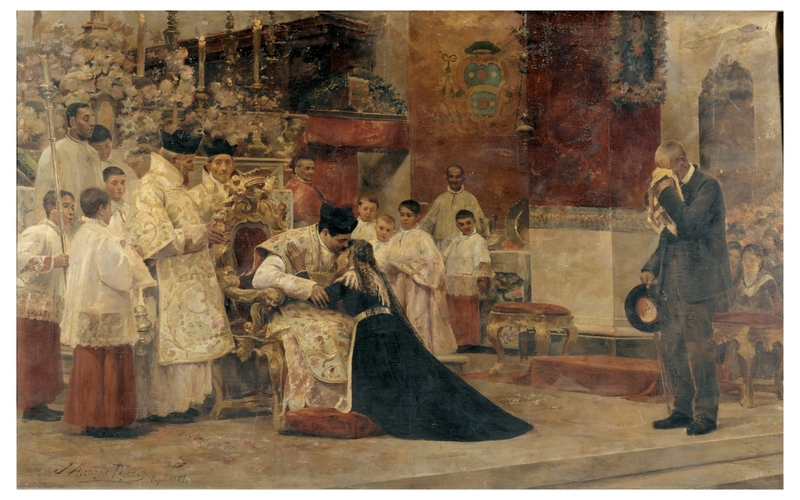 She was led to the altar by the dean, the cantor, the treasurer, and the major archdeacon, who are the first four dignitaries, and is taken back by them to her place in choir, where she finds upon returning the [carreau] which a verger brought there immediately after she gave her oath. The abbess heard Mass there with her twelve nuns. Initial G[audeamus omnes] from a Gradual: Christ, Virgin, and Saints, about 1370–77. Don Silvestro dei Gherarducci (Italian, Florence, 1339–1399). Ink, tempera, and gold on vellum. Let us return to our Ordinal of Rouen. There remains the section de festivitatibus sanctorum. It does not favor an excessive number of feasts, lest they be dull and distasteful, nor does it want for all of them to be cut out. (Besides the feasts of Our Lord, the Purification, Annunciation, Assumption, and Nativity of Our Lady, there are very few, and two hundred years ago there were even fewer.) Here is how this section begins, and this is the most salient part: Oportet nos festivitates sanctorum discernere qualiter celebrentur, ne sint nobis fastidiosae si superflue agimus: aut si nimis reticemus, eorum juvamine careamus. It prescribes a fast for the Vigil of the Assumption, and it establishes that the feast be of a superior rank to the other feasts of Our Lady, so that the others might be lesser. I do not know how they should be lesser, for it goes on to say that it should be of the same solemnity as the feasts of the Annunciation, the Purification, the Nativity of Our Lady, and of All Saints. Perhaps it means that these feasts should have no vigils or octaves. It was Sixtus IV that granted the latter an octave in 1480, and there are churches that have still not done so. On the day of the Commemoration of all the Faithful Departed, they say the Office of the day in addition to that of the Dead. This is still observed in the Roman Breviary and a few others. The Office of the Dead had no hymns nor invitatories. It seems that it had Second Vespers; there are a few missing words in the manuscripts than could hardly indicate anything else. What confirms my conjecture is that second Compline appears like the other Hours of this Office. Second Vespers are still said not only in Cluny, but also in the illustrious churches of Vienne, Tours, and Besançon. On semi-double feasts Matins of the feria is said rather than Matins of the feast. The highest-ranking feasts in the kalendars of some French dioceses. Author’s note: The learned M. Bocquillot, currently canon of Avalon, and author of the excellent Traité historique de la liturgie. Jacques Nicolas Colbert, reigned 1691-1707. The same is the case for simple feasts in Roman rite before the reforms of St. Pius X. Where is the first painting from? I take it from Spain, no? It’s by Jose Alcazar Tejedor.